This year, go for homemade Valentine gifts to let the special people in your life know how much they mean to you by your time and effort! What is Valentine’s Day? Also called Saint Valentine’s Day, it is a feast or occasion held every 14th of February in celebration of love. If you’re looking for trendy Valentine’s Day homemade crafts to give as gifts, this should be your first stop. Jewelry crafts so seem intimidating but give it a try and you’ll be hooked, indeed. This pair of teardrops earrings looks like a gift your mom, sisters, or girlfriends will appreciate and wear with their OOTD, for sure! A friend or family who loves romantic and sentimental lightings could use these homemade Valentine gifts. If you have that friend or family in mind, you still have time to pull off this DIY prism candlelight in time for Valentine’s Day. Hunting DIY Valentine gifts for him is a challenge in itself. Luckily, we have this cute DIY leather hearts that is perfect for men of all sizes and shapes. After all, most men do like leathers in their accessories. This leather conversation hearts in a necklace, key fobs or key rings, especially will melt their hearts, for sure. Your green thumb mom or granny will love these Valentine’s Day succulent planters along with the plants, for sure. Those pastel pink and white colors are so dainty, they will adore them, indeed! Let someone special know that you can SO BE his Valentine with these cool homemade Valentine gifts idea. It also comes with cute printable tags which you can grab here. Here’s one of the more simple Valentine gifts you can give to your young daughters or nieces. These glittery blocks work as a puzzle, you see, but they also make a fancy decoration for their room. Make love potions out of bath salts and bubble baths, because they make great Valentine’s gift! We’re also sure you have a friend or family in mind for this gift set and we can’t agree more! Adorn your loved ones’ fridge with these charming DIY heart magnets! It isn’t much and it’s super easy to make, but your sweet gesture for a friend or family is what counts the most. 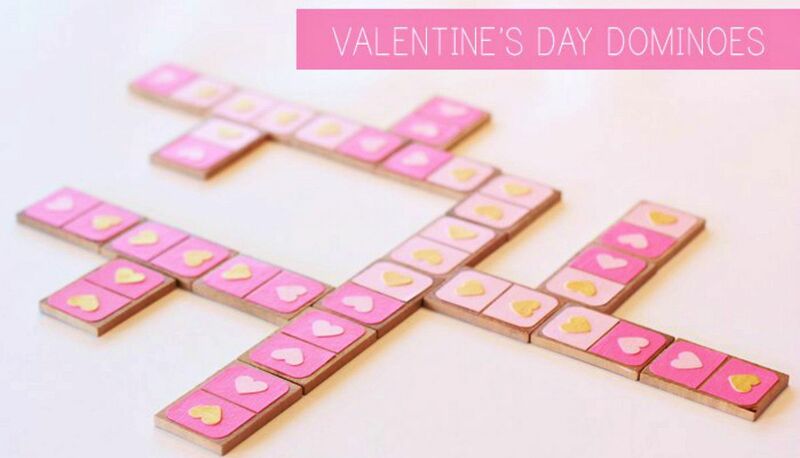 This simple heart-themed domino set would make a perfect gift for anyone. Plus you can also spend the holiday playing around with these. Honey Jars Photo by Earnest Home Co.
Sweets for the sweet indeed with these honey jars and a gift tag with a sweet pun anyone will melt for. It’s a sweet Valentine’s gift you can give everyone with sweet compliments in return, for sure! Let your kids have some fun too and give them treats in these Valentine Chinese take out boxes. For this gift idea, you can use candies but you can also add conversation hearts and other treats. Create your own Valentine bath bombs for that special someone who deserves some pampering. An easy DIY bath bomb recipe you made yourself is Valentine’s treat, indeed! A lot of people would love to have edible gifts in a heartbeat, especially kids. And I for one wouldn’t miss it for anything. This Valentine’s day prepare these easy-to-make cookies then wrap them in a special packaging or a mason jar. Add Valentine’s Day printable gift tag and voila! A gift your kids will love, for sure. This framed art idea is quite perfect for any man in your life. It’s simple and cute yet the message is clear and sweet. 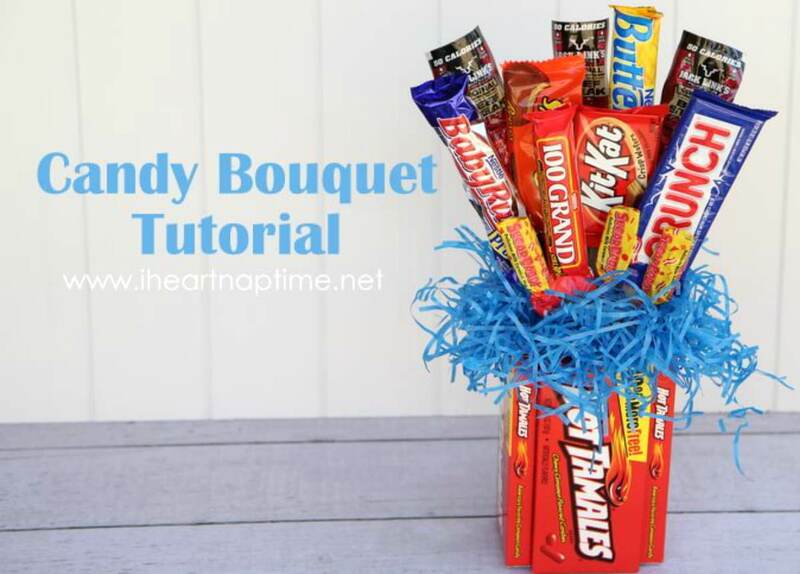 These classic candy bouquets for gifts will never grow old. Most of us are sweet tooths, after all. While we often arrange ours in designed mugs or small buckets, let’s give this different idea a try. This time we’ll use a styrofoam block like you would a flower arrangement. These heart bracelets are perfect gifts for friends and sisters! But these are also cute gifts you can give for everyone because it’s priceless while inexpensive to make. You only need different colors of embroidery floss, but here is where it gets to be priceless. You need to devote time and effort and a bit of your creativity and imagination. For your more glamorous and trendy family and friends, here’s a gift that will please them but spare your pocket, big time. Get their admiration and favor with this DIY metallic glitter heart pillow. All it takes is 10 minutes to make this simple yet sweet token of love. Make this 8-bit heart necklace set–one for you and one for your special someone. Sugary sweets never go wrong and this heart cookies bouquet is a sure winning gift idea! You can get the recipe from the video tutorial here and you will never go wrong with this one. 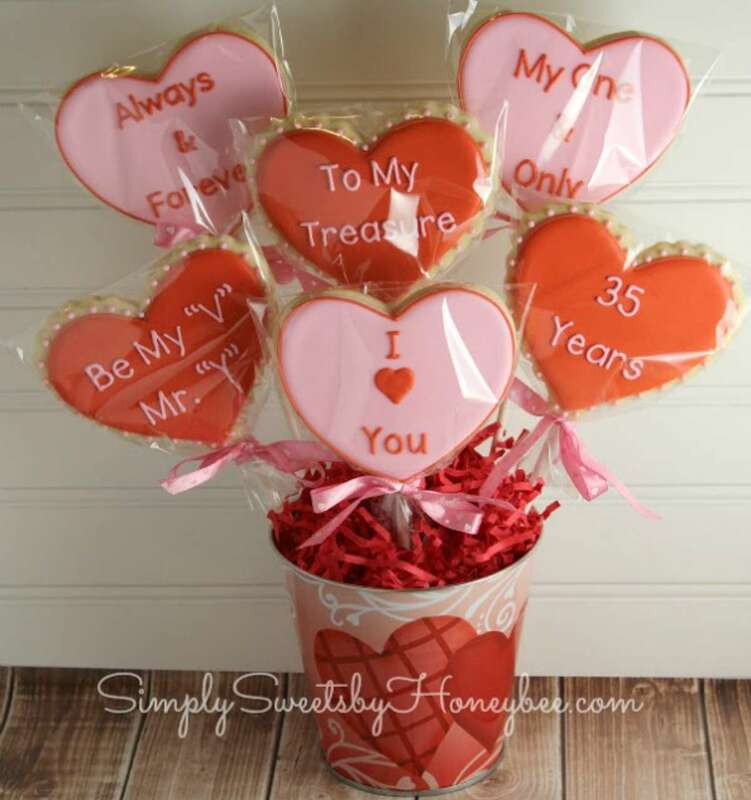 Your sweetheart will love these sugar-cookie lollipops embedded with candy hearts. You might also want to check out this Christmas sugar cookie recipe for inspiration, but instead of the signature Christmas colors, add red candies and hearts. We can never get enough of leather hearts for gifts this Valentine’s Day and we have here another one. Only this time it’s stuffed and a bit of sewing skill will be needed. Your loved one will love this unique and sweet Valentine gift idea. It is a custom art made from yours and your loved one’s fingerprints. It’s simple but the message is there: “You are the missing puzzle piece of my life.” Awww. 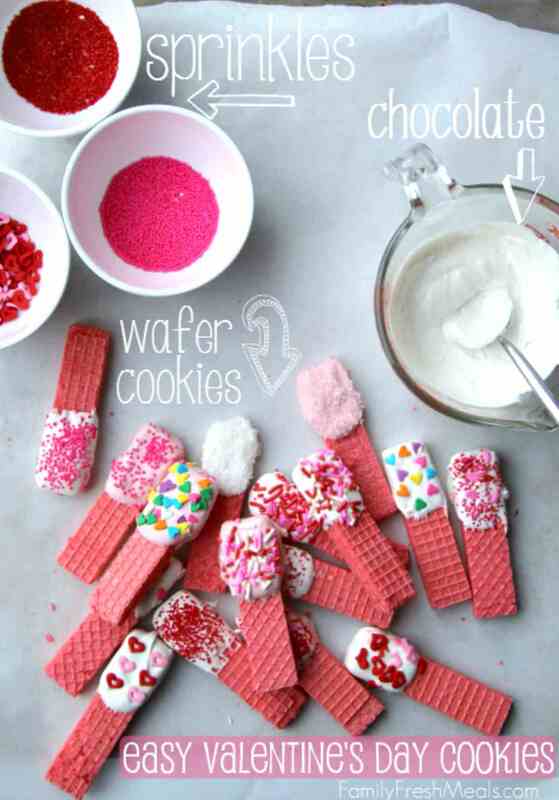 You can pull off this gift-making idea in time for Valentine’s Day since it’s pretty easy and straightforward to make. Valentine’s Day is just a few short weeks away so why don’t we take a break from the same old candies and roses and make some homemade valentine gifts? Let’s put on our crafting gloves because DIY gifts are a romantic way to show your loved ones how much you truly care for them. Which of these homemade Valentine gifts are you eyeing on to work out this weekend? We’d be delighted to know all about it in the comments section below! Editor’s Note: This post was originally published on January 22, 2015, and has been updated for quality and relevancy.